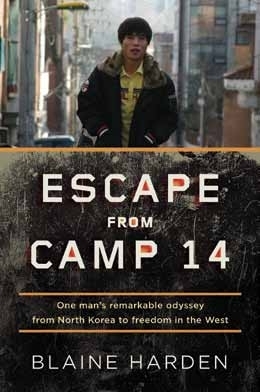 IN A VERY BRIEF TIME, Escape from Camp 14 has become a famous book. This is not surprising. It is well-written and easy to read even if its subject is horrific. Since it began life in the form of a newspaper article, it has been serialized on BBC radio and extracted around the world in a variety of other newspapers. It tells the story of a man now called Shin Dong-hyuk, who lives in Seoul after having spent some time in the United States. But he was formerly Shin In Geum, born in one of the toughest North Korean labour camps where there was no faith, hope or charity, just sheer mind-boggling brutality. Today he has found a sort of peace, recount­ing his story to audiences who listen to his tale with horror. Shin does not tell his story directly. He tried to do that in a book published in Korean soon after he arrived in the South Korean capital but it attracted little attention and sold few copies. Now, however, having been taken up by the veteran American journalist Blaine Harden, the story is getting the attention outside the Korean peninsula that Shin’s auto­biography failed to attract in its original language. There have been other accounts of the conditions in North Korean labour camps. What makes Shin’s story different is that he was born in a camp, and is acknowledged to be the only person with such a background ever to have made good an escape. Otherwise, the details of how he was treated, of the casual brutality and even of the summary executions, are similar to other accounts that circulate among a relatively small number of people. Christian Solidarity Worldwide has drawn attention to many of these. Eyes of the Tailless Animals, published by Soon Ok Lee in 1999, tells a similar story of cruelty and savagery, often directed towards Christians. In 2004, the BBC’s Access to Evil detailed horrendous chemical and biological experiments that it claimed were conducted on prisoners, among whom those from religious backgrounds featured prominently. This book does raise some questions. Harden knows no Korean and by his own account was searching for a good story with a human rights angle. He certainly seems to have found it. The public execution of Shin’s mother and brother for attempting to escape is described more than once and illustrated by a line drawing. But the story is different from the one Shin told in his own book. In that version, the execution was a surprise. He now admits that it was he who betrayed his mother and brother to the authorities. He hardly knew his brother, several years his senior, and he hated his mother, who beat him for stealing her food. When he realized late one night that they were plotting to escape, he had no compunction in betraying them to the only official he could find, in return for a promise that he would be appointed class monitor. Alas for Shin, the official in turn betrayed him by not revealing the source of his information. As a result, Shin and his father, whom he also seems to have hated, were detained and tortured in the belief that they knew more about the planned escape than they were willing to reveal. Only gradually did Shin realize why he was being so badly rewarded for being an informant. Somewhat late in the day, his story was believed – the man who had failed to credit Shin disappeared and was no doubt tortured in turn – and Shin’s life was spared. The second version may be correct, but who is to know? It certainly makes for a more dramatic if equally appalling story, with Shin subsequently coming to realize, with the help of religious groups in the United States, the enormity of what he had done. He now expresses repentance. Years ago, I remember South Korean intelligence officers saying they were reluctant to rely on testimony from North Korean defectors since the more harrowing the story, the greater the impact and the stronger the possibility of making money out of it. They said those who had spent their lives in a system that relied on lies and deceit would not change just because they were now in South Korea. Nevertheless, Shin’s account is echoed, and aspects of it verified, in other narratives. Perhaps his story, in reaching a worldwide audience, will at last draw more widespread attention to the desperate state of human rights in North Korea. In any case, I suspect that Shin’s story, harrowing as it is, will not change the general perception that it is the North Korean nuclear programme that really matters. Although awareness of North Korean human rights issues have a higher profile today than ten or twenty years ago, and may well be considerably heightened by this book, nowhere do they top the international agenda. Human rights trail a long way behind bombs and rockets.